A content management system (CMS) manages the creation and modification of digital content. Keeping up with the rapid development of Vue.js the team has created support for Vue.js developers who need to integrate content management into their projects. There's a Vue starter project, a plugin, and tons of docs on integrating Prismic into projects. You can start by using the Vue.js starter project. Simply define, edit and publish your content in a Prismic content repository, query and fetch content from our API, then integrate the content into your components. Or if you prefer you can directly download it as a ZIP archive. You can now open your browser to http://localhost:8080. You should see a tutorial page explaining how to create a Vue component with content managed in Prismic. And your Prismic journey begins! 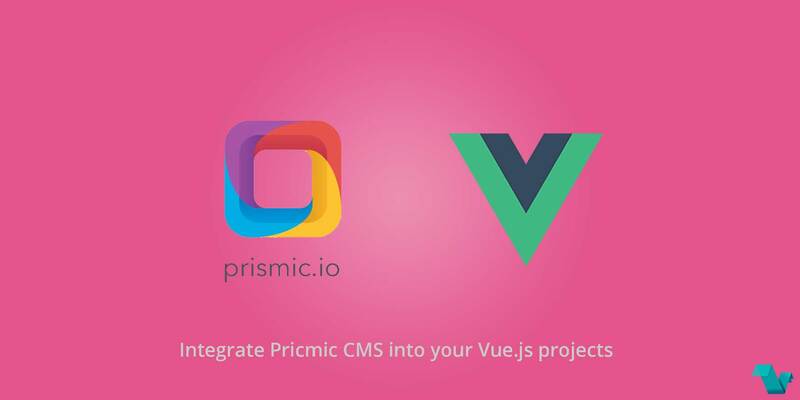 Now you're all set to start building your Vue.js project with Prismic content management. Here are the next steps you need to take. First, you'll need to model your pages, posts, events, etc. into your Custom Types. Refer to the user guides to learn more about constructing your Custom Types thanks to the drag-n-drop builder. After you've created and published some documents in your Prismic repository, you'll be able to query the API to retrieve your content. Find explanations and plenty of examples of queries in the How to Query the API page. The last step is to integrate the content into your templates. Check out the Templating section of the documentation to learn more. The 1-user repository is free with all core writing room features. You can find the team on Twitter: @prismicio.